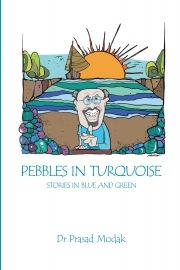 Description of "Pebbles in Turquoise "
This book is a collection of stories in the sustainability space sharing personal experiences and encounters in Authors life. This collection is the third publication of the Author based on his blogs. Through these stories and musings, the Author attempts to raise important environmental concerns that do not have easy answers. Sometimes, the Author relates to his experiences as an academician and consultant uses humor and satire to discuss various environmental issues. The messages are often hidden and Knowledge is embedded in an implicit manner.The book can therefore serve as additional reading material (as "light reading") for a graduate course on environmental management and sustainability. In his three decades of international work, the Author has been to places and met with people. In these encounters he has had extraordinary experiences that enriched his life. The stories take in these cases a form of a travelogue and share some of his memoirs. This makes the reading interesting as the stories are a blend of "blue" and "green" and appear like pebbles in "turquoise", scattered on a seashore! Prasad was a Professor at Centre for Environmental Science & Engineering at IIT Bombay (1984-1994) and later as Professor (Adjunct) at the Center for Technology Alternatives in Rural Areas (CTARA) (2009-2017). He is currently the Executive President of Environmental Management Centre LLP and Director of Ekonnect Knowledge Foundation. Prasad's career has spread across a wide spectrum of agencies across the World with diverse portfolios in the arena of environmental management. He has worked with almost all key UN, multi-lateral and bi-lateral developmental institutions in the world. These include the World Bank, IFC, Asian Development Bank, European Investment Bank, UNEP, UNIDO, UNDP etc. Apart from Government of India and various State Governments, Dr Modak’s advice is sought by Governments of Bangladesh, Egypt, Indonesia, Mauritius, Thailand and Vietnam. Dr Modak has published books with UN University, Oxford University Press, UNEP and Centre for Environmental Education in India. His latest book “Environmental Management Towards Sustainability” was released in December 2017 with CRC Press. He has authored and executed more than 500 consulting reports and trained more than 8000 professionals across the World. Prasad served as Hon Editor of the Journal of Indian Water Works Association between 1998 and 2004.He is currently founder President of Society for Indoor Environment. Reviews of "Pebbles in Turquoise "